Dan Rizzie was born in Poughkeepsie, New York in 1951. His father, an airman in World War II, became a cultural officer in the State Department. Rizzie spent his youth traveling the world from a French kindergarten in Cairo, Egypt to Jordan, to the West Indies, culminating with three years of high school in New Delhi, India. This international childhood explains Rizzie’s imagery. When he returned to India recently, he was surprised to see the sawtooth edges of tile borders and the curves of Islamic arches. He recognized them from his own art where flowers have curved stems and tulips have sawtooth edges. Rizzie went to Hendrix College, a private liberal arts school in Conway, Arkansas where he studied art. He attended graduate school at the Meadows School of Art at Southern Methodist University in Dallas. The pressure towards abstraction was strong in art schools at the time, but Rizzie wanted to make figurative art that would locate his work firmly in the world of realistic images. Rizzie’s imagery is connected to the natural world. 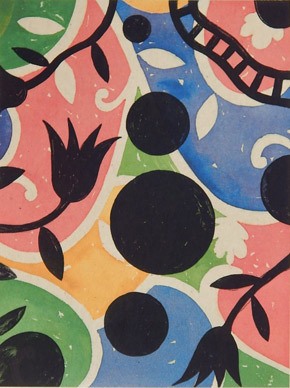 His symbols display a range of associations from microscopic views of single cells to floral portraits influenced by the tradition of English botanical illustration. Although he was trained as a painter and continues to produce oils and mixed media collages, Rizzie truly enjoys printmaking. 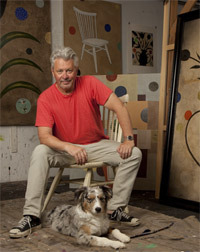 He began printmaking in the late 1970s at Tamarind Institute in Albuquerque. He found that it freed him creatively, allowing him to explore new ideas and expand his creative process through collaborations with professional printers. Dan moved from New York City to Sag Harbor about 20 years ago. After the hard edges and repeated squares and rectangles of the urban streetscape, Dan was suddenly waking up to deer in his yard. The title of the publication print Hawthorne Place is a reference to the street where Dan lives, but more specifically to nature. Sag Harbor is an area with much to offer visually. The 1994 print Aqua Fria became the inspiration for the Cleveland print. One of the print club members saw it and fell in love with it. Dan was asked not to recreate it but to create a work inspired by it. To compose a color background, Rizzie made a watercolor which was scanned into a computer and printed digitally onto Japanese Kitakata paper. He also made an ink drawing on mylar which was laid over a polymer plate coated with a light sensitive substance. When exposed to light, the plate was etched with the design. The polymer plate was then inked in black and printed over the color background. The black image reflects Flatbed since, if you look closely, you will see the nearby train tracks. Tulips are one of Dan’s favorite motifs. When the color printed Kitakata paper was dampened for the chine collé process (mounting it onto the heavier sheet of Somerset paper), the printing ink bled just a bit. Dan loved this effect because it is similar to the blurriness of a watercolor. HAWTHORNE PLACE. The Print Club of Cleveland Publication No. 93, 2015. Digital and polymer gravure on chine collé (Kitakata Japanese paper mounted to Somerset paper). Printed in 2014 by Cordelia Blanchard assisted by Britney Madalone and Jolene Salcido at Flatbed Press, Austin, Texas. "What information I assimilate and translate into imagery comes from a belief that like life, art is concerned with the search for one’s self, one’s thoughts."